Written by Will on May 10, 2012 and posted in Crafts. Playing video games and eating cupcakes goes hand in hand. Playing games and most snack foods work well together but I came up with an amazing combination. I made some game themed cupcakes. Angry Birds cupcakes, Mario cupcakes, Halo cupcakes and more! I will be making more of these very soon. I’m going to do some for game releases: Halo 4 being one of the ones that are definitely on the list. 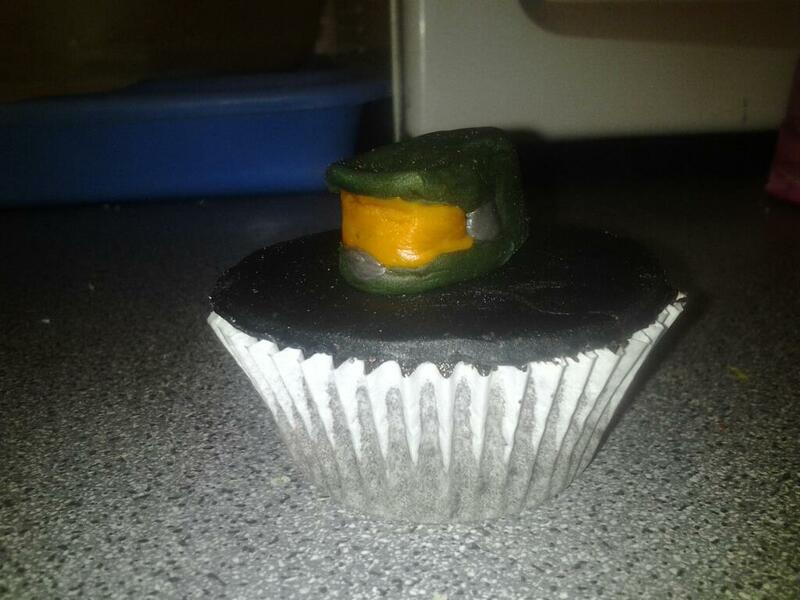 I made a few of these fairly quickly without any earlier thought as to what the designs were gonna be; in fact I didn’t even plan on making anything fancy at all, just ice the cupcakes. Instead it ended up turning into something pretty amazing. I hardly wanted to eat these but they were oh so tasty! Firstly you need to make cupcakes, there are loads of recipes on-line but you could always just use a store bought mix. My girlfriend makes brilliant cupcakes but she says that Betty Crocker is the next best thing to home-made so we always use that if we don’t make it from scratch. You also need icing to make the designs. 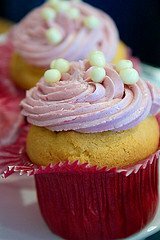 Again there are ready-made alternatives to making your own icing, and making it can be quite difficult. There is a little trick to speedily making your own icing that is a godsend – Mallow Fondant. You need food colouring (I recommend gel over ordinary liquid for this), icing sugar, olive oil/veg oil and white marshmallows. Put the marshmallows in a microwaveable container with 2 tablespoons of water. Microwave it for 15 seconds then stir, repeat until all the marshmallows melt. Once the marshmallows have melted start adding icing sugar a little at a time until it begins to firm up, add a tablespoonful of olive oil or vegetable oil at this point and keep adding sugar until it forms a ball. Once it’s firm enough to handle with your hands rub a bit of oil into your work surface and your hands, grab the icing and start kneading until there are no sugar balls in the icing. Once the icing sugar is all absorbed your are ready to add colour, simply fold a little at a time of the food colouring into the icing until you have the colour you want. Once you have your icing and cupcakes you can either cut the top of the cake flat or work with the bump in the surface. Place a circle of whatever colour of icing you want over the entire top of the cake to give you your canvas. It helps to use a jam glue to stick the icing circle, mix some jam (usually apricot but use what you want) with a little bit of water in a pot and heat till the jam dissolves. Then the creative bit starts and you have to make whatever designs you want on the cupcakes. 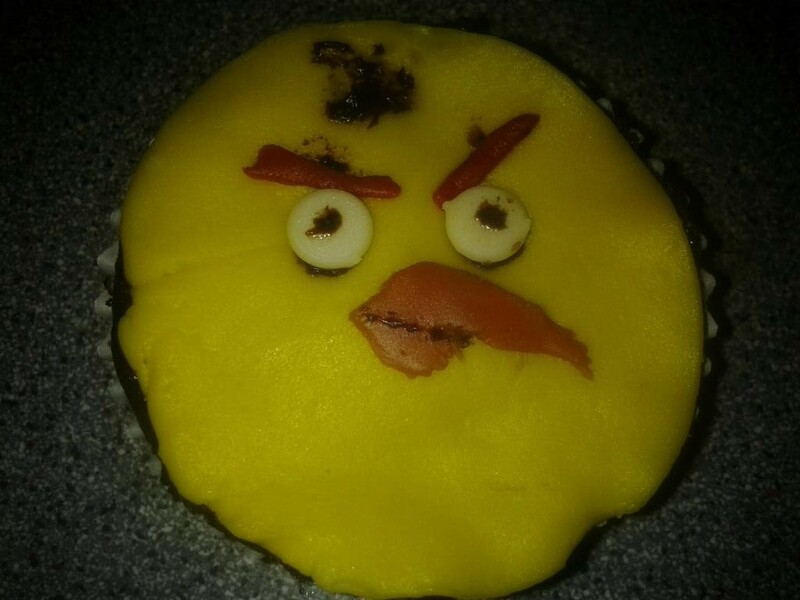 When I made my cupcakes I originally decided to make the red and the yellow Angry Birds. My Angry Birds Cupcakes were not to difficult to create. I simply used a red or yellow icing top for the cupcakes and added the birds features to that. Both birds had eyes, a beak and eyebrows. Each had their own variants of those as well as a few unique features to the birds. 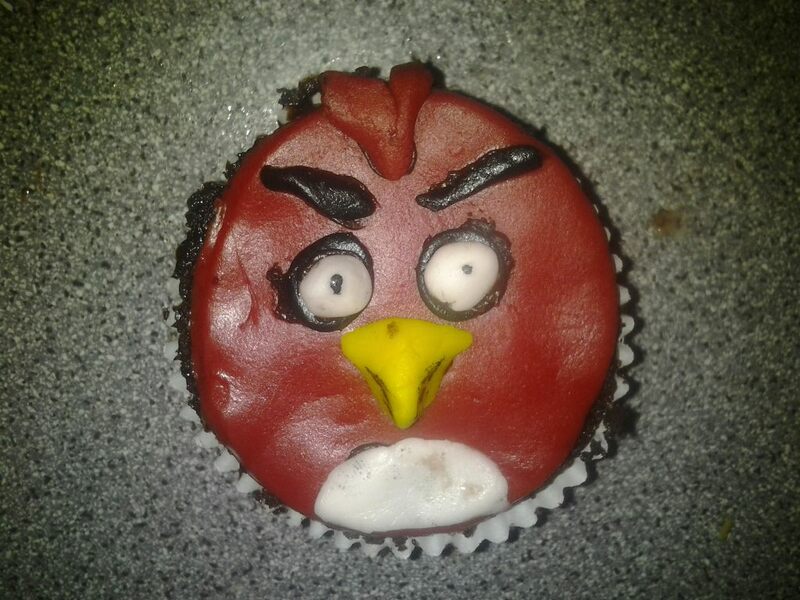 I made a few more of the Red Angry Birds cupcakes that I don’t have a picture of, this was the first one I made. The other ones were slightly better looking so I guess you do improve with practice. 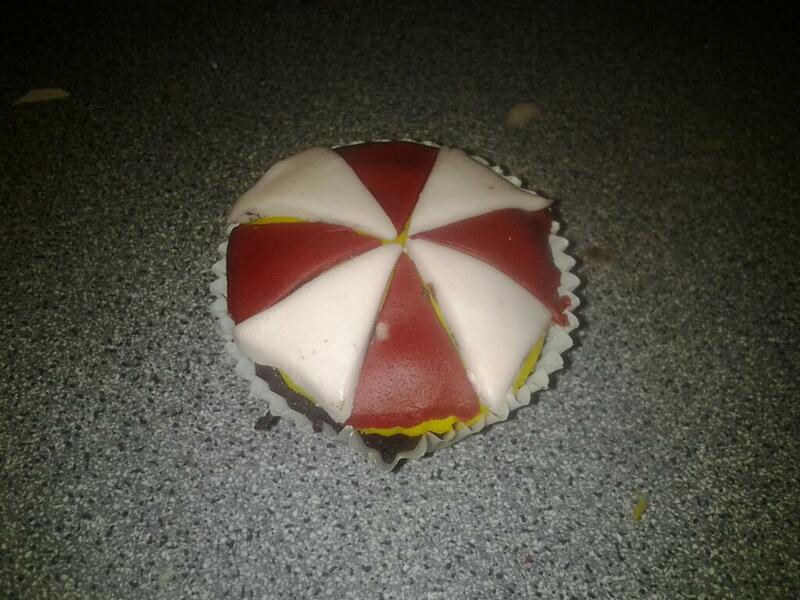 I also made the Resident Evil – Umbrella Corporation Logo on one of the cupcakes. This one wasn’t that difficult. I cut 2 circles of icing, one red, one white. I then cut each into 8 equal segments and discarded 4 of each colour. Then it was just a case of cutting a slight inward arch into each piece and fitting them into place. I then decided to go a little 3D with the designs and made a Mario cupcake. 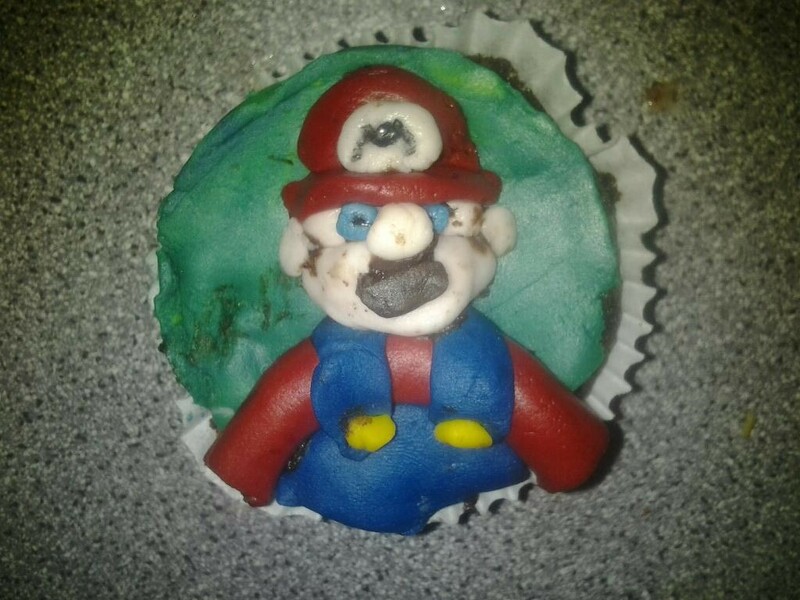 I didn’t work too cleanly on this one (I was using chocolate fondant for glue and got it all over the cupcake) but it’s still clearly Mario, we shall just say he was eating chocolate and got it all over himself, OK? haha). 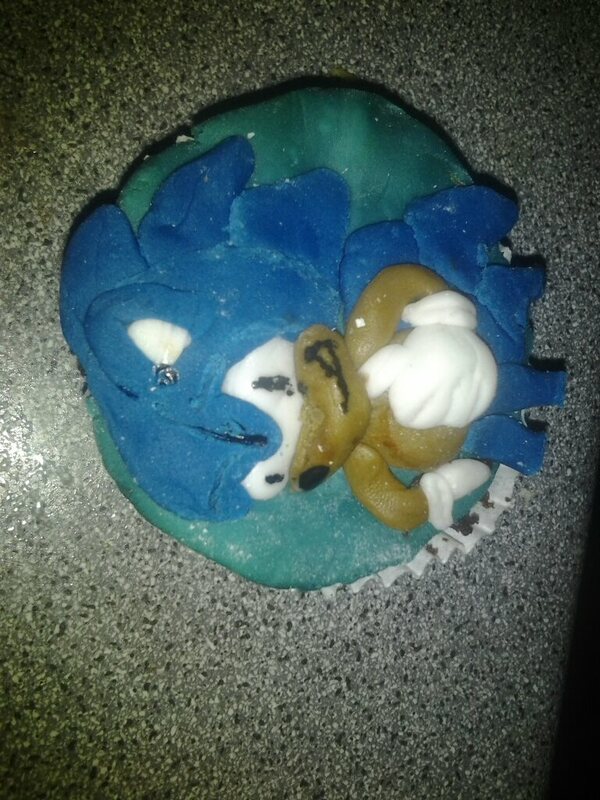 If I made Mario I had to make a Sonic cupcake, right? And I did. I made it in the 3D style the same as I did with the Mario one. This one was a lot more intricate than the last one. Things like the hands and the face were pretty difficult. 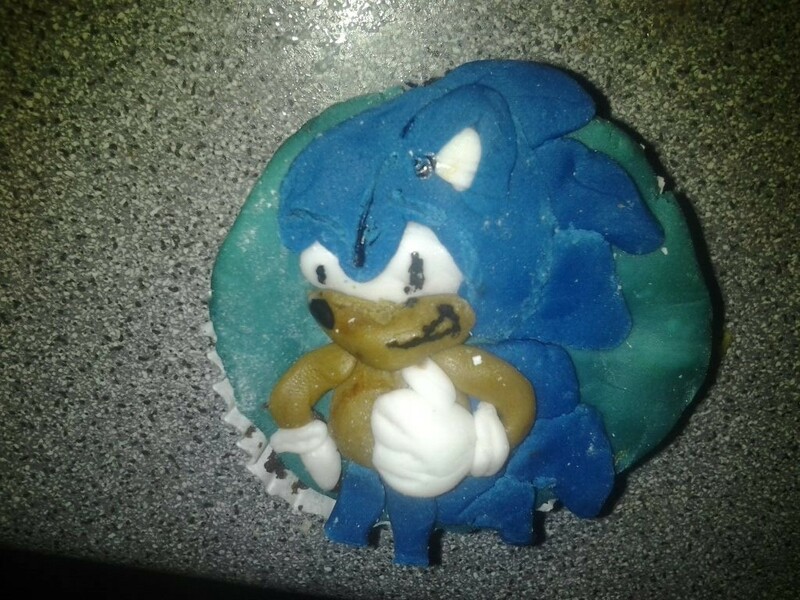 The fact the blue icing was far too dry was pretty clear in the finished cupcake, it looked crumbly and all the blue seams were visible but it was still cool. I them wanted to make something that was a little more modelling and not a jigsaw so I settled on making the Master Chief‘s helmet from the Halo games. I decided on this because it wouldn’t be too critical to add all the small details to such a small model to make it look like it should plus I have a friend who would (and did!) love it. This one was made with just a few balls of icing but a lot of shaping and tweaking. 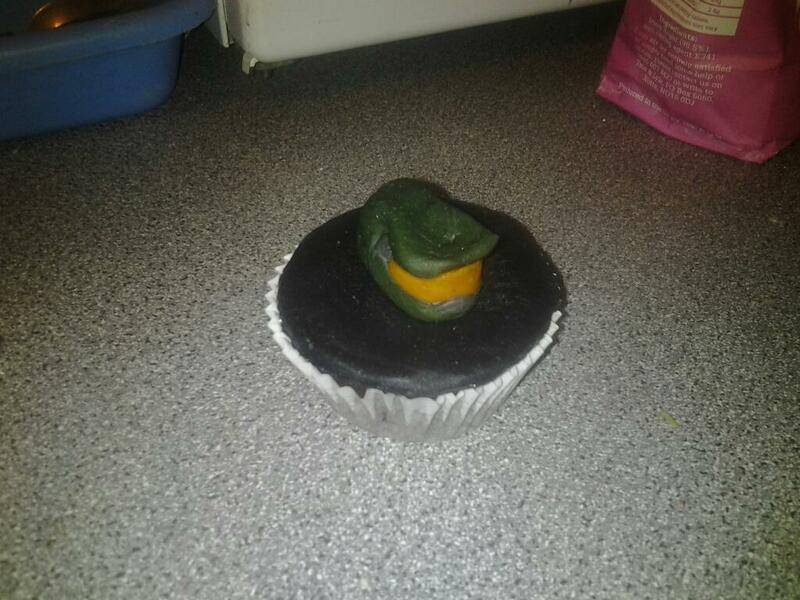 I’ll be making a lot more of these cupcakes soon, Halo 4 is the next big game release I plan on making them for but that’s a long way away, I’ll surely make more before then. If you want to see me make a specific design then leave a comment below and let me know what you’d like me to make.